The Wendish Heritage Society’s 2009 March Country Tour included, on Saturday 7 March, a visit to Tatura and to its Irrigation and Wartime Camps Museum at 49 Hogan St, Tatura. On Saturday evening, we dined, and most participants were accommodated, at the Terminus Hotel, Shepparton, ready for a guided tour of Shepparton on Sunday 7 March. Organisers were Clay Kruger and Glenys Wollermann. In brief, the Tatura Museum collection is based on three main themes: (1) the History of Irrigation in Victoria’s Goulburn Valley, (2) the Local and Family History of Tatura and District since white settlement and (3) the history of the seven World War 2 Prisoner of War and Internment Camps and the Garrison and Hospital which were established in this area. In relation to the World War II Camps, there were seven such camps in the area, which held about 4,000-8,000 people at any one time. Three camps housed Prisoners Of War (POWs), captured in various theatres of war around the world and transported to Australia for the duration of the war. The POW camps included Dhurringile Mansion for German Officers; Camp 13 near Murchison for 4,000 mainly Italian and German POWs but also some Japanese after the Cowra breakout; and Camp 6 near Graytown, a wood cutting camp in the bush for Italian, German and Finnish POWs which included the crew of the Kormoran. The remaining four camps held Internees who were civilians living in Australia or other Allied territories and countries at the outbreak of war and were deemed to be a security risk because of their nationality. The camps housing these Internees were: Camps 1 and 2 near Tatura for single males, mostly German and Italian; Camp 3 near Rushworth for mostly German family groups and Camp 4 near Rushworth for Japanese family groups. Each housed approximately 1000 internees. Camp 1 had a first class hospital and the camps were situated in the Goulburn Valley where food was plentiful and there was a good supply of water from the Waranga Basin. The official German War Cemetery in Australia is situated next to the Tatura Cemetery. A very interesting group of Tatura Internees were the Templers from Palestine and their history is presented in detail under the heading “History” on their website www.templers.org.au. In brief, in July 1941 near the start of World War II, 536 Templers were transported by the British Mandate Authorities from Palestine to Australia, where they became internees near Tatura. They organized regular school, sport and religious services and crafted ingenious items for their daily needs or cultural necessities. By August 1946, some Templers left the camp to look for work and to fend for themselves and in July 1947, the Office of the Temple Society in Australia was moved from the Tatura Camp to Melbourne. When the State of Israel was formed in 1948 and the return to Palestine was not an option, an offer was made by the Australian Government to support the Templer cause and in 1949, land is purchased in Boronia and subdivided into building blocks for a Boronia Templer Community. Then in August 1950, the Temple Society Australia (TSA) was formed. The Templers connection with Palestine went back to Christoph Hoffmann, who in 1854 helped to set up a “Society for the gathering of the People of God to Jerusalem”. In 1858, his group inspected Jaffa as a possible settlement and in 1861, they established the organization “German Temple”. Eventually in 1867, some families settled near Nazareth and in 1869, Christoph Hoffmann helped to establish the Templer colonies at Haifa and to continue the American Templer colony at Jaffa. This is a black and white pencil drawing by Karl Muffler, which he completed at Tatura internment camp, northern Victoria, around 1942. It documents the exterior of the living huts, numbers 10-15 (Karl slept in hut 10) . Karl Muffler was interned as a German enemy alien at Tatura, from 1939 to 1944. 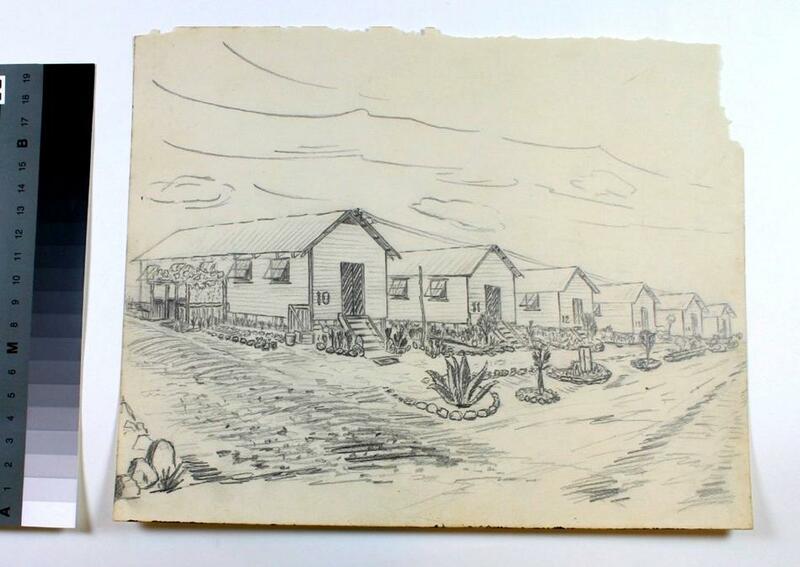 This is one of seven sketches completed by Karl Muffler in Tatura internment camp, 1939-1944. This item relates to Karl Friedrich Muffler, qualified pastry chef and confectioner, born in 1900, who migrated to Melbourne from Germany in 1930, aboard the passenger liner ‘Balranald’. Muffler quickly established himself in Melbourne, commencing employment with Bill Ikinger (who had recruited and sponsored him) at his cake shop in Brunswick, as well as joining the long-running German establishment ‘Club Tivoli’. Muffler went on to establish his own business, ‘The Embassy’ in Malvern, and in 1939 married fellow German migrant Mathilde ‘Hilde’ Mayer. At this time they were members of the ‘German Labour Front’ of which Adolf Mayer (Hilde’s father) was president. On 4th September, 1939 Karl Muffler, along with dozens of other German residents (including his father-in-law), was placed into police custody as an enemy alien. He was transferred to Tatura internment camp and while there undertook woodcarving and drafting classes and worked as a cake decorator. He was transferred to a Forestry Commission camp in Broadford, and finally released in 1945. With no family left in Germany he decided to stay in Australia and became naturalised in 1947. After the war, Muffler accepted a position at William Angliss Food Trades School in Melbourne teaching ex-servicemen new skills in cake decoration. He maintained a connection to the German community though Club Tivoli and died in 1996.